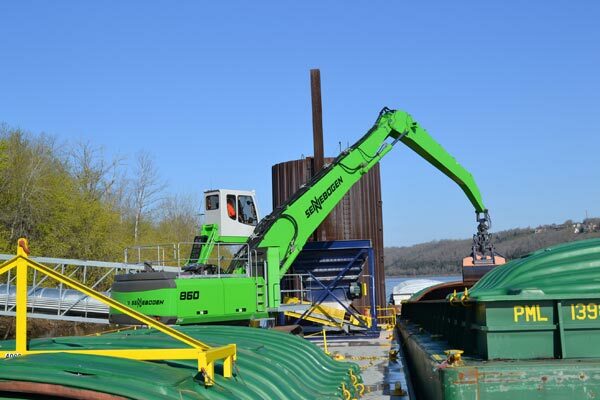 Hydraulic cab height provides the operator with a clear view into the barge and the hopper. When Ruben James arrived in Melbourne, KY in the summer of 2013, he had a number in mind:. As Terminal Manager, James is responsible for offloading the material and moving it into storage by conveyor as cost-effectively as possible. As he set out to equip the terminal, he told Ben Sutkamp at Murphy Tractor that his goal was 500 tons per hour. 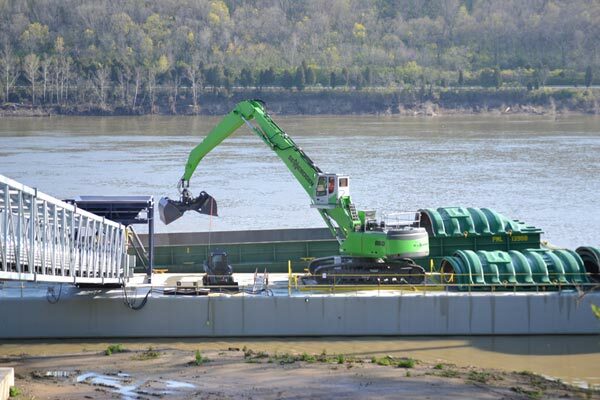 Sutkamp told him, “I have a machine that can do that for you.” By mid-August, James’ new electric-drive SENNEBOGEN 860 R-HD material handler was unloading its first barge. 860 R-HD easily keeps pace with new conveyor system.